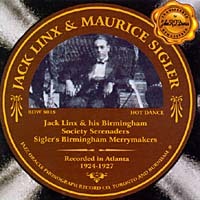 The complete recordings of Birmingham, Alabama bandleader Jack Linx, as well as the four sides by fellow Birmingham leader Maurice Sigler. Includes two unissued tests by Jack Linx. Jack Linx (cl,ss,as) dir. Coleman Sachs (c), Sidney Patterson (cl,as), Seibert Traxler (cl,ts,bar), Eph Tunkle or Gilbert Davis (p), Maurice Sigler (bjo,v), Frank Manning (bb), Carroll Gardner (d). Samuel Becker (tb) added; Charles Gardner (bjo,g) replaces Sigler. Maurice Sigler (bjo) dir. unknown (c), (cl,as), (ts), Eph Tunkle or Gilbert Davis (p), (bb), (d), N. Sol Bearman (v).